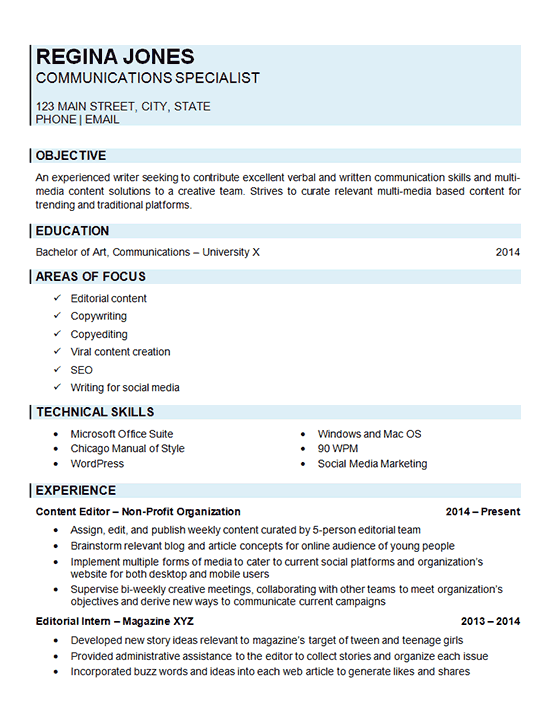 View the Communications Specialist Resume Example for an entry-level professional content editor with degree in Communications. The job seeker is looking to enter a company’s content development department as an editor and contributor. With extensive understanding of the impact communications has on a business, the individual creates valuable content on numerous platforms and works well with other departments to communicate a fresh message. This writer has shown a particular interest in writing for teen audiences and would be well fit in a similar position. Assign, edit, and publish weekly content curated by 5-person editorial team. Brainstorm relevant blog and article concepts for online audience of young people. Implement multiple forms of media to cater to current social platforms and organization’s website for both desktop and mobile users. Supervise bi-weekly creative meetings, collaborating with other teams to meet organization’s objectives and derive new ways to communicate current campaigns. Developed new story ideas relevant to magazine’s target of tween and teenage girls. Provided administrative assistance to the editor to collect stories and organize each issue. Incorporated buzz words and ideas into each web article to generate likes and shares.